The Major League baseball All-Star teams where announced this week. You can complain about the starters all you want, but it’s a fan vote and until they change it there’s nothing you can do about it. 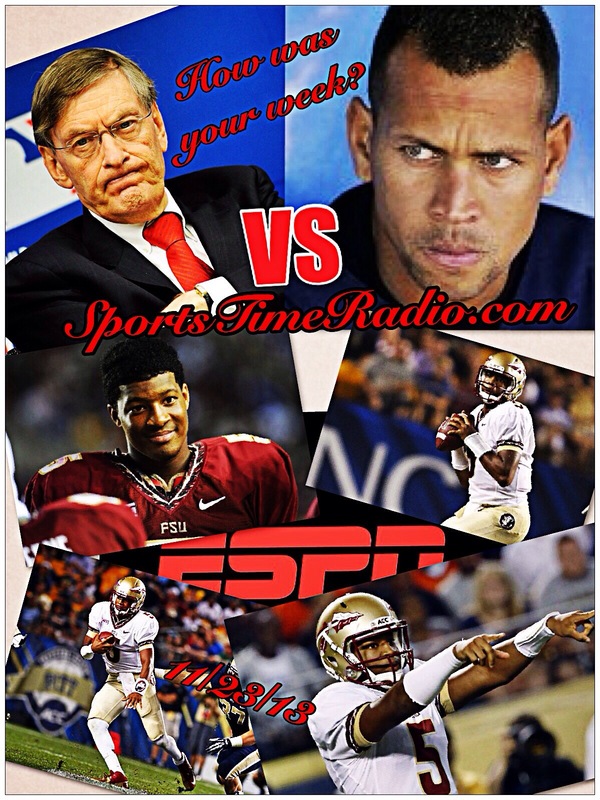 If you’ve listened to the Sports Time Radio podcast you know that Mr. Fantasy can’t stand the fan voting. I thought the American League reserves were close to what I thought they would be with the exception of a couple of players. I thought that Mookie Betts of the Boston Red Sox would be the choice for that team, but they went with Brock Holt. While Betts has better stats and is a full time starter I understand why they choose Holt. Holt has played every position except for pitcher or catcher and since the game “counts” a manager can use that kind of flexibility on his bench. The big surprise to me was the fact that Alex Rodriquez (A-Rod) wasn’t named to the team or even in the final 5 voting. Is there anyone who isn’t surprised by the kind of numbers A-Rod has out up. A-Rod has played in 78 games, he’s hitting .280 with 16 home runs and 47 RBI’s. His OPS Is .892 with an Slugging Percentage of .505 and an On Base Percentage of .387. I can’t even begin to tell you how odd it is that I’m actually writing that A-Rod may have been snubbed as an All-Star this season. Is there a chance that after all of the trouble baseball has had with A-Rod that he was more or less kept off the All-Star team. A-Rod’s teammates Dellin Betances and Mark Teixeira were selected as reserves and Brett Gardner is on the Final 5 ballot. You could make a case for Xander Bogaerts of the Red Sox being left off the team, but he has a chance to make the team as he is in the Final 5 vote as well. Besides Gardner and Bogaerts, the other 3 players on the Final 5 ballot are Yoenis Cespedes of the Detroit Tigers, Brian Dozier of the Minnesota Twins and Mike Moustakas of the Kansas City Royals. Who do you like out of those 5? In the National League the Final 5 ballot looks like this. Johnny Cueto of the Cincinnati Reds, Clayton Kershaw of the Los Angeles Dodgers, Jeurys Familia of the New York Mets, Carlos Martinez of the St. Louis Cardinals and Troy Tulowitzki of the Colorado Rockies. While only 1 of the players will make the N.L. team you could make a case that 4 of them should already be on the team. I’ve heard a lot of people om television complaining that Kershaw wasn’t selected. Kershaw is 5-6 with and ERA of 3.08 and while those are good numbers they’re not as good as the other 2 starters who are on the Final 5 ballot against him. Cueto is 6-5 with a 2.61 ERA and Martinez is 9-3 with an ERA of 2.70. Why the big outrage over Kershaw when Cueto and Martinez have better numbers and no one is complaining that they weren’t named to the team. Looking at the National League team far and away the biggest snub is Tulowitzki. Tulowitzki leads all National League shortstops with a .320 batting average. He’s 4th in home runs with 9, 2nd in RBI’s with 45 and has played in 75 games this season. Jhonny Peralta of the St. Louis Cardinals won the fan vote and Brandon Crawford of the San Francisco Giants was added to the team as a reserve and I think both players belong on the team, but you can’t tell me that Tulowitzki doesn’t. There’s your 5 final ballot National League guys. Who are you voting for? Who’s the top free agent left on the market in the NBA? Actually it would be LeBron James. James is very busy playing general manager for the Cleveland Cavaliers making sure they sign the players he wants them to sign. Case in point the Cavaliers just signed 32-year-old Williams to a 2-year, $4.3-million contract. Williams played 27 games for the Charlotte Hornets last season. Williams averaged 17.2 points per game and 6 assists per game. Williams did play a little over 30 minutes per game, but don’t expect that out of him for the Cavaliers next season. Tristan Thompson is still trying to work out a deal to return to Cleveland and it’s being reported that James won’t resign with Cleveland until they come to an agreement with Thompson. It had been reported that Cleveland reached an $80 million extension contract deal with Thompson on the first day of free agency, however, the deal fell apart and there has been no update regarding the contract discussions since. There is no other team in the NBA that is going to give Thompson this kind of money; so expect him to resign with the Cavaliers eventually. Don’t forget that Cleveland has already signed Kevin Love to a $110 million contract extension. Additionally, the Cavaliers resigned guard/forward Iman Shumpert for $40 million. When the franchise re-signs James and Thompson as widely expected, Cleveland Cavaliers owner Dan Gilbert will be facing a massive luxury tax bill. Don’t forget that J.R. Smith and Matthew Dellavedova are also free agents, but James hasn’t expressed any interest in resigning either player yet. While James has found it very easy to spend owner Dan Gilbert’s money this off season have the moves Cleveland has made moved them any closer to winning an NBA title. The NBA Champion Golden State Warriors told David Lee and his agent that they would do what they could to trade him. There was even some talk that Golden State would package their 1st round draft pick with Lee in a deal, but that didn’t happen. Yesterday Golden State traded Lee to the Boston Celtics for veteran swingman Gerald Wallace. Lee lost playing time when the Warriors opted to go with smaller lineups that featured more 3-point threats. Lee averaged 7.9 points and 5.2 rebounds in 18.4 minutes last season, his lowest averages since his rookie season. In the 2013-14 season, Lee averaged 18.2 points and 9.3 rebounds while playing 33.2 minutes per game, but Warriors head coach Steve Kerr decided to give the bulk of Lee’s playing time to Draymond Green, who averaged career highs in points (11.7), rebounds (8.2) and assists (3.7) during the Warriors’ title run. Wallace played in 32 games for the Celtics last season. He averaged 1.1 points per game and 1.8 rebounds per game. Wallace hasn’t averaged double digit in points since 2011-12 season when he split time between the New Jersey now Brooklyn Nets and the Portland Trailblazers. Wallace has 1 year left on his contract and will make 10.105.855 for the 2015-16 season. It seems like Boston got the better end of this deal, but Lee didn’t fit into Golden State’s system; so it was better for them to deal him even if they didn’t receive fair market value. A quick apology for not having a show Wednesday this week. There was a scheduling mix up and when I went to get the show set up for Dan the Man and I it was too late. I’m sorry about that. Alex Rodriguez walked out of his arbitration hearing this week after it was ruled that Bud Selig wouldn’t be called to testify. This was all planned by Rodriguez’s legal team to try to get the public on his side. I could only imagine Rodriguez pounding on the table and getting up and leaving and I had a good laugh about it. Rodriguez is never going to admit that he used P.E.D’s and then lied to everyone about it but I think any real fan knows he did. I found it very interesting that his legal team had a press release ready to go right after the walk out happen. Even more proof that this was a planned event. Rodriguez ended up on the radio at WFAN in New York, but that interview was a huge joke as well. It was Rodriguez blaming Selig for everything and then denying any and all of the accusations that have been made against him. I also found it interesting that Rodriguez and his team wanted Selig to testify at the hearing but Rodriguez wasn’t going to testify at the hearing. Why Selig, but not Rodriguez? A couple of big trades in major league baseball this week. On Wednesday the Detroit Tigers sent 1st baseman Prince Fielder and $30 million dollars to the Texas Rangers for 2nd baseman Ian Kinsler. This may actually be a trade that ends up helping both teams in the long run. With the trade of Fielder; Miguel Cabrera will move back over to 1st base and prospect Nick Castellanos will get a chance to play 3rd base. Also Kinsler can move into the lead off spot in the Tigers batting order and take some of the pressure off of Austin Jackson. With Fielder’s money off the Tigers book they’ll be able to look into resigning Max Scherzer. Cabrera is also getting close to the end of his contract and you have to figure it’s going to cost between $25 – $30 million a season to keep him in Detroit. On the Texas side of the trade Fielder will add power to the line up. I’d guess he’ll split time at 1st base with Mitch Moreland and also be a designated hitter. Fielder plays as close to everyday as any player in the majors; so the Rangers should get a lot of quality at bats out of him. The other trade happened yesterday when the St. Louis Cardinals sent 3rd baseman David Freese and pitcher Fernando Salas to the Los Angeles Angels of Anaheim for outfielder Peter Bourjos and minor league prospect Randal Grichuk. There where a lot of rumors that the Cardinals where looking to make a trade, but that they where trying to acquire a shortstop. By trading for Bourjos I have to wonder if the Cardinals are out of the Carlos Beltran free agent derby. Looking at the trade you have to wonder if it’s the first move for each teams and that they have another trade in the works. Last night the Chicago Bulls lost 98 – 95 last night to the Portland Trailblazers. Derrick Rose left this game with is what’s being called a non contact knee injury. Bulls fans went through this last season, but this time it was his right knee. He left the stadium on crutches and there hasn’t been any time-table as to this injury. Rose is schedule to have an M.R.I. in Los Angeles on Saturday. Rose was injured in the 3rd quarter and the Bulls went on to blow a 21 point lead in this loss. Rose had 20 points in about 28 minutes last night before getting injured. There was always talk about the Bulls giving the Miami Heat a run at the Eastern Conference and a spot in the NBA Finals. Without Rose it will start to look more and more like last season when Rose was gone for all of it. I guess Bulls fans will hold their breath until the M.R.I. results are known. Now you know from listening to the show that Dan the Man and I rail on ESPN quite a bit. In week 1 or 2 of the college football season the network decided that the Heisman trophy would go to Florida State red-shirt freshman quarterback Jameis Winston. Now Winston has been accused in a sexual assault case where his DNA has been found. Let me state that there have been no charges filed against Winston as I write this and I’m not hear to decide what the verdict here should be. The reason I bring this up at all is I’m interested to see where and or how ESPN gets themselves out of this. It doesn’t matter how this case plays out it looks this situation will cost Winston any chance at the Heisman trophy. I haven’t watched a lot ESPN as of late, so I don’t know if there running away from their early award. I’m guessing they are. The voting is still a few weeks away and I’ll be interested to see who comes out as the front-runner. So many sports stories this week it’s tough to figure out where to start. P.E.D’s, NCAA violations and football started; so here we go. Alex Rodriguez (A-Rod) got himself suspended for 211 games. By far the most out of all the other performance enhancing drug users. He of course appealed the suspension so he could play this season with the New York Yankees. The reports are that they won’t hear the appeal case until the off-season. So, A-Rod will be able to finish this season and then we’ll see. Let’s face it, this guy is guilty. His press conference was a huge joke and he just lied his way through it like every other statement he’s ever given. I think the worst part for me about this guy is he’s been going around speaking to kids about not using steroids and other type of drugs. How frightening is it that this guy would’ve been standing in front of a group of children telling them how bad something is and then turning around and doing it right afterwards. All the other players accepted their suspension which was 50 games for each player. The new story that has just come out and we didn’t get to it on the show was Jack Clark accusing Albert Pujols of using performance enhancing drugs. I’m sure we’ll cover this on Sunday’s show. The Texas Rangers and the Detroit Tigers made trades to cover the positions where they lost players to drug suspensions. The Tigers got José Iglesias in a three team deal to play shortstop while Jhonny Peralta is gone and the Rangers traded for Alex Rios to fill Nelson Cruz’s spot while he’s gone. I believe these where the only two players that were on contending teams that where suspended during this time. Johnny Manziel found himself involved in another situation with the NCAA this week. It’s being reported that Manziel was paid for some autographs which is a violation of NCAA rules. Apparently there is a video of Manziel signing some helmets that were sold by a broker. Of course there’s nothing wrong with signing the helmets and there’s no proof on the video the Manziel was paid for the autographs. The Manziel family has hired a lawyer who’s dealt with the NCAA before, so we’ll see what else comes out of this situation. 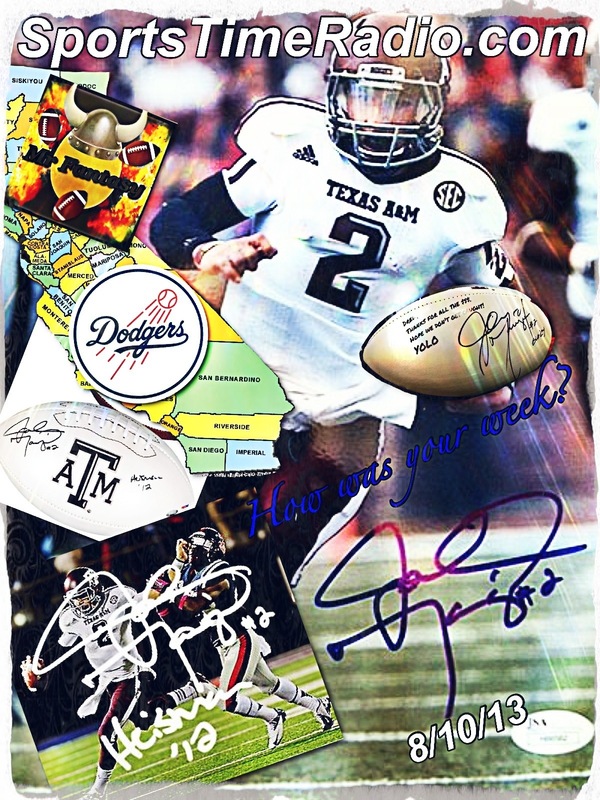 I have heard some legal experts say they doubt the NCAA will ever be able to prove if Manziel was paid for these autographs or not. Jadeveon Clowney and Teddy Bridgewater’s names have also came out during this investigation but no evidence has been found against any of these players. With the college football season just a few weeks away I doubt any of these players will miss any time at all. Now if you’ve listened to the show you know about “The Bet.” Dan the Man and Mr. Fantasy made a bet on the show on who would be the best team in California. Dan the Man took the Dodgers and Mr. Fantasy has all the other teams. Right now the Oakland A’s are the only team standing in Dan’s way of winning. We added that the team that goes the farthest in the playoffs would win “The Bet” as well. The Dodgers are winning the National League West while the A’s are in a battle to win the American League West. It looks like the only way either of these teams will make the playoffs is to win their division. By the way the winner of “The Bet” gets a fitted hat. The NFL pre-season has started, so football is right around the corner. It can be tough to watch an entire pre-season game. I always watch the first few series of a game but once the starters come out of the game it’s not as entertaining to watch. It looks like the biggest battle in the pre-season is who’s going to be the starting quarterback for the Philadelphia Eagles. Michael Vick and Nick Foles will both get snaps with the first team offense during the pre-season. Teams don’t show a whole lot during the pre-season but we get to sit through these games.